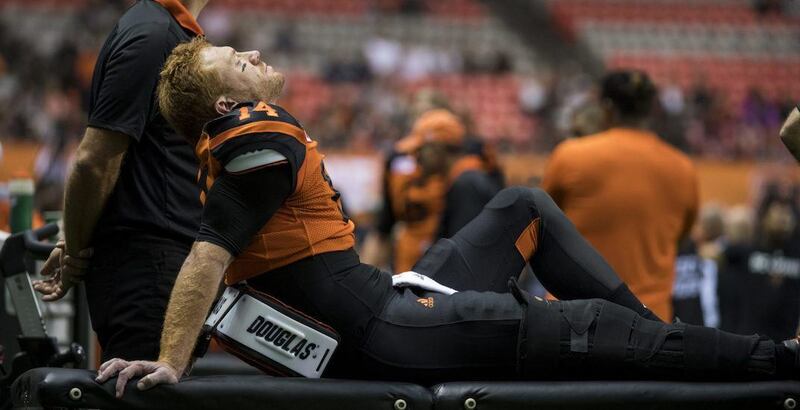 Travis Lulay’s season is over. Hopefully his career is not. Just how significant remains to be seen. Lulay reportedly suffered an ACL tear on the second play from scrimmage. While he was hit by two Alouettes players, Lulay said the injury occurred before the collision. TSN’s Farhan Lalji reports that the injury requires surgery, though it’s not as bad as first feared. Initial reports suggested that Lulay could be out as long as 12 months. That long of a recovery period could mean the end of Lulay’s career given his advanced age. Lulay, who has played nine seasons in BC, turns 34 later this month. The 2011 Most Outstanding Player and Grey Cup MVP moved to a backup position last year, giving way to up-and-comer Jonathon Jennings. That was supposed to be his role this year too, until the veteran appeared to find the Fountain of Youth, wrestling the No. 1 job back from Jennings. Though he’s out for the season, head coach Wally Buono says Lulay can still play a role with the team. “If he can’t play for us, he can help us win still,” Buono said after Friday’s win against Montreal. With Lulay out, the Lions have announced that they have signed 24-year-old quarterback Quinn Epperly. Epperly attended the Dallas Cowboys’ rookie minicamp, but was not signed to an NFL contract.